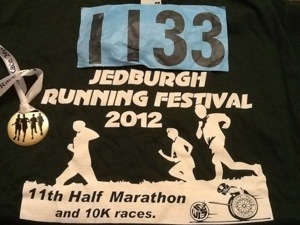 Today my semi silent coach took me across the border into The Borders so that I could take part in the Jedburgh Festival of Running. When I say across the border, from our house in Dumfries and Galloway, we actually cross the Scottish border twice, venturing into Disputed Country, before heading into the Scottish region of The Borders which neighbours our own region. For those of you who aren’t familiar with Scotland, if you imagine the shape of Britain as a body, we’re up near the neck of Britain, heading across the chin. I should make maps for a living. This was my second year at this event and forewarned meant forearmed. Last year I went expecting what was billed as an undulating course. Hah! 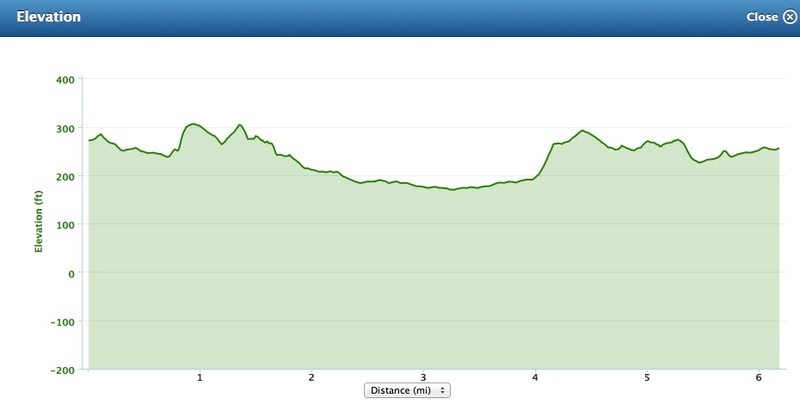 This year I went expecting hills…many, many hills. And wind. Up on the hills. The event coordinators had this year added an ultra marathon to the event, which already boasts a half marathon, the 10k and a wheelchair 10k. The ultra had long since started by the time we arrived to an already packed car park at just before 10am. We were lucky to find a space for the truck and after testing the toilets (always a must) I went to collect my number, chip and T-shirt. The entire process was a breeze, although the queue for the half marathon people was much, much longer. After a coffee, a wander round and a few dynamic stretches (I take warming up very seriously!) I went to the starting line, along with a few hundred others. I had my Jeff Galloway Easy 10k app on pause, ready to go, and just before the starting gun my Garmin finally found enough satellite signal to spark into life. I’m sure that the weather conditions weren’t helping – when we arrived it was raining lightly, but with very low misty clouds promising more. However, it actually dried up as we started, although the clouds remained. I had the app set for a 62 minute 10k, although in all honesty I knew that this was unlikely. I just wanted to beat last year’s time of 66 minutes. Despite the fact that I had my earphones in and my beat synced tunes playing away as I rounded the abbey bend all I could hear was the delightful drone of bagpipes. I know this sounds a bit sarcastic, it isn’t meant to be. At times there is nothing more uplifting than the stirring sound of the pipes. Today was one of those times. We ran down the High Street accompanied by the echoing slap of trainers on the tarmac. As we headed out of the town and crossed the main road I knew from experience what was coming next. Hill One. By this time I’d already taken one set walk break (I was running 4:1 ratios) and I was determined not to walk until I reached the hill top. However, I realised, half way up, that I needed to play these hills and work them into my strategy. I decided that I should run as far as I could, then walk the rest and then let gravity take me down the other side, running as fast as I felt I could safely. Of course this mucked up my 4:1 ratios, but I knew they would level out as the race progressed. This worked really well and I found myself passing people on the way up the hills and on the way down. After 3km of hills (I kid you not) we started to head down towards the main road again. I remember passing 3 miles at just under 30 minutes and 5k just over it. I was on schedule. The 10k and half marathon runners followed the same course to a turn around point which the 10kers turned for home and the halfers carried on for a few miles more before their turn around point. It’s a simple course, which seems to work well, albeit a tough one that doesn’t see many personal bests! When I said hills, believe me, I meant HILLS! Once I turned the wind hit me. I hadn’t noticed it on the way down to the turn, but, boy, I noticed it on the way up away from it! At one point I had to hold my cap on to stop it from flying away. The road rises gently for quite a long way towards a flyover before turning off down through a cut to the road below. I knew that as soon as I turned that corner it was pretty much downhill back to Jedburgh. My pace had suffered as a result of the wind and the uphill sections and miles 4 and 5 were around 11 minute mile pace, which had brought my overall pace down to around 10:30. Knowing that there was only a mile or so left, I started running more and walking less, reducing walk breaks to 30 seconds at most. I kept pushing on into the town, running through a tunnel of autumn trees whose fallen leaves had created a plush carpet of golds and reds. It was gorgeous. As I reached the 800m count down I knew I’d easily beaten last year’s time of 66 minutes. That was all I wanted to do. I crossed the river and saw the delighted face of my semi silent coach encouraging me on. “You’ve smashed it!” he shouted. I had indeed! The muddiest part of the run was the last 50m across the grass to the finish. My poor Brooks. I hit the button on my Garmin. 64:29 giving me an overall pace of 10:25. That’s fine. I’d knocked 2 minutes of last year’s time. Next year I’ll knock another chunk off and eventually I’ll be one of those doing a hilly Jedburgh 10k in under 60 minutes. I was a bit disappointed with the lack of goody bag this year. I’d paid separately for my t-shirt, so that wasn’t included, but we only got a medal. I collected a banana, some water and a Lidl version of a Mars Bar and a money off voucher for Run 4 It. Looking at the t-shirt afterwards I wondered if the lack of goodies was down to a lack of sponsors. However, I was only a bit disappointed and happy with my medal and eatables. After a quick shower in the local leisure centre (next year I must remember my swimming costume) my semi silent coach and I went for lunch. I really believe in supporting local businesses, especially as so many had opened especially to cater for the runners and their supporters, rather than buggering off home or bringing a packed lunch. I realise that this might make it a dearer do, but my jacket potato and juice cost £7, hardly enough to break the bank! So, next year, do I do the 10k again or try the half marathon? I’d been put off the half by my running friend George who did it last year. He complained about the hills and the wind, saying it was a really tough half course. However, I’m starting to think that I’m maybe designed for longer races. My 10k pace isn’t that far ahead of my half marathon pace. It’s certainly worth considering. EDIT: Having now had a chance to review my Garmin data, I’ve added a link above and also a copy of the elevation chart, just to show how hilly this course is. Having seen it again, I feel quite proud of myself.